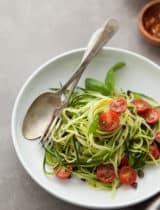 Zucchini noodles are tossed with ribbons of kale, sun-dried tomatoes and a pesto-like dressing for a simple but sturdy summertime salad. 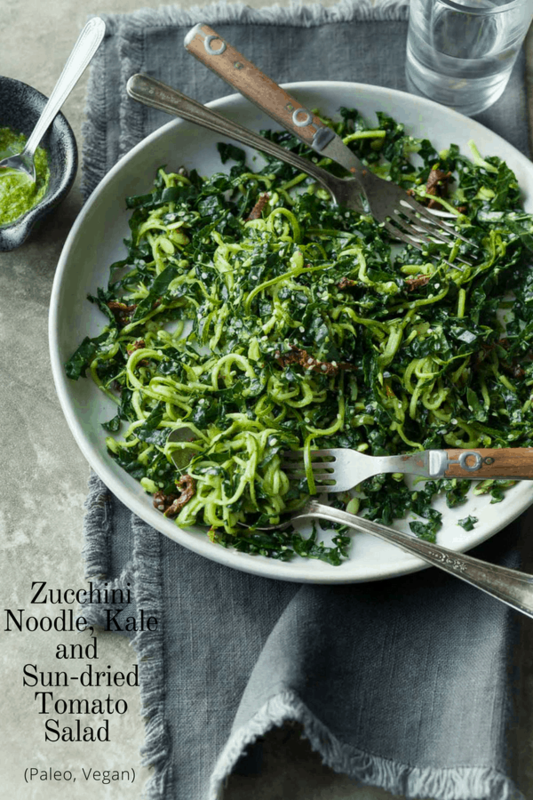 The sun is shining and summer squash season is in full swing, which means zucchini noodles are on heavy rotation at my house at the moment. 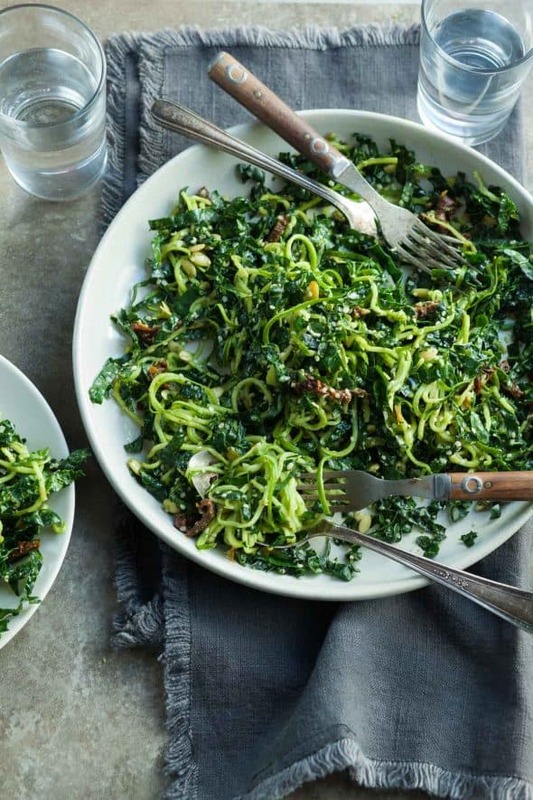 While I certainly make good use of my spiralizer and julienne peeler year-round, there’s something about the summer months that has me in a zoodle kind of mood. 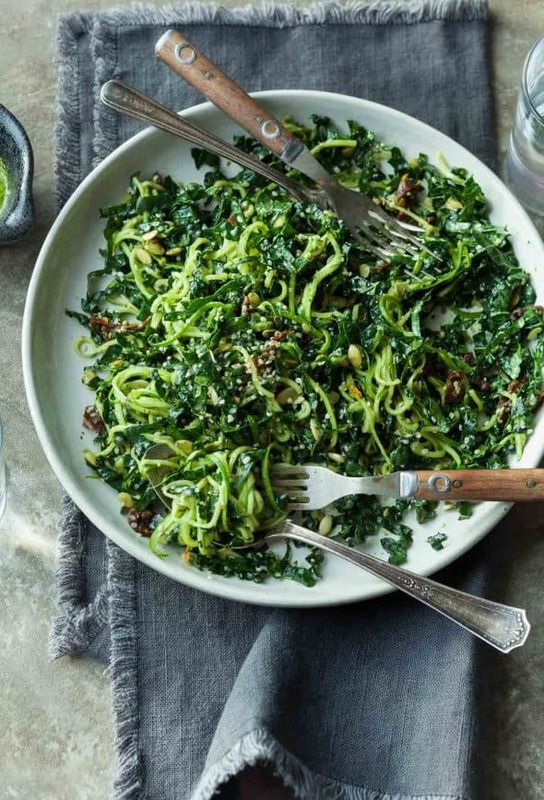 This zucchini noodle salad combines thin strands of zucchini with ribbons of kale and flecks of chopped sundried tomatoes for an easy and effortless summer side or lunch that’s perfect for those days it’s too hot out to even think about turning on the oven. 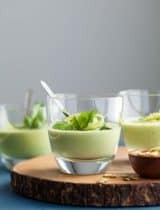 Whether you’re planning a picnic, or headed to a barbecue this season, chances are you’ll probably need a dish to bring along that packs up easily and keeps well in the heat. 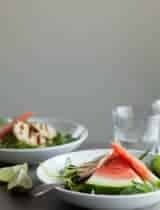 While most lettuce based salads can’t be dressed ahead of time and wilt in the heat, this hearty salad comes to the rescue with its staying power. All you need to finish are a few finely chopped, chewy and intensely flavored sun-dried tomatoes and a handful of nutty pumpkin and hemp seeds for a bit of nuttiness and crunch. 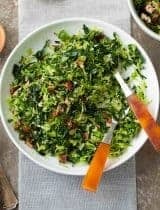 What you end up with is a vividly green salad with lots of vibrant flavors and textures that will surely become a summer (and year-round) favorite. Combine basil, parsley, garlic, pistachios, and salt in a mini food processor. Pulse until finely chopped. Add olive oil and lemon juice and process until smooth (adding more olive oil as needed to loosen dressing). Set aside. Strip kale leaves from stems (discard stems). 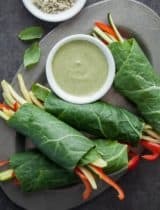 Roll leaves and thinly slice. Place in a large bowl and add half the dressing. With clean hands, firmly massage the leaves to work in the dressing and tenderize the leaves. 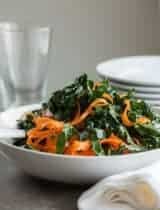 The kale should look darker and feel softer and silkier. Set aside. 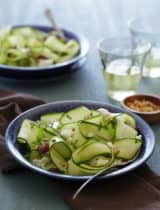 Using a spiralizer or a julienne vegetable peeler, cut zucchini into noodles. 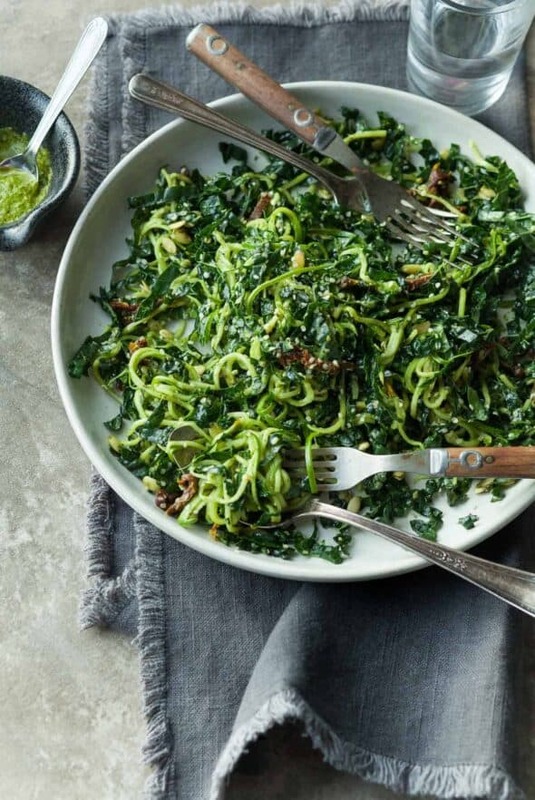 Gently toss the zucchini with the kale, sundried tomatoes and the rest of the pesto. 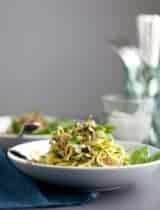 Sprinkle with pumpkin and hemp seeds and serve. Thank you for a salad that keeps and transports well! The dried tomatoes must add an excellent hit of flavour. Even though summer has passed, I'm Pinning this to try!